Piero di Giovanni, called Lorenzo Monaco was a Florentine painter, also known as Lawrence the Monk. He gained this religious nickname from his time within the Camaldolese Monastery of Santa Maria degli Angeli of Florence. 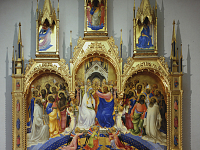 He eventually left the Monastery to pursue a career as an artist, painting in the International Gothic style of the 14th Century, as well as in the style of the Sienese School of painting. In this respect Monaco merged the Sienese style with the prominent Florentine style of the time. Cosimo Rosselli was a Florentine artist, of the Quattrocento Italians, who trained under Neri di Bicci (1419 – 1492). He painted for Churches in Florence, including the Sant’Ambrogio, and the Church of the Annunziata, as well as for churches in Lucca and Fiesole. In 1480, he was among a group of artist invited by Pope Sixtus IV (1414 – 1484) to work on frescos in the Sistine Chapel. He had two prominent pupils and assistants, Piero di Cosimo (1462 – 1522) and Fra Bartolomeo (1472 – 1517). 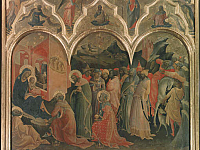 The piece in the Uffizi Gallery, Adoration of the Magi, was painted by Monaco and then later by Cosimo Rosselli (1439 – 1507). This piece was created for the Church of Sant’Egidio in Florence. The Central panel was painted by Monaco, while the Prophets and the Annunciation in the upper section were by Rosselli. Monaco’s style used vivid colors with fluid and graceful lines, providing a transition from the Gothic style of artists like Duccio (1255 – 1260) and Giotto (1267 – 1337) into the Quattrocento artists he influenced such as Rosselli, Masaccio (1401 – 1428) and Fra Angelico (1395 – 1455). (Kren and Marx, Web Gallery of Art).